Clifton Packaging Group entered into Ovenable packaging about 5 years ago and have supplied various formats of packaging under our Made2Cook packaging range. Up till now our OVENCERT CLH350-HD printed laminated range of films have been compliant to all current legislation and have been certified and tested up to 1750C. Our NEW range CLH440-HD has been certified by Smithers PIRA for use up to 2250C for 2 hrs. Our CLH440-HD has been tested and certified by Smithers PIRA for food safety performance up to 2250C (4350F) up to 2 hrs. Our Made2Cook packaging a combination of our own bespoke developed ovenable components which include PET films, inks, lamination glues and manufacturing processes using EU certified REACH approved materials. Our Made2Cook range is a Dual ovenable which means it is Oven safe & Microwavable safe. It is designed to be suitable for exposure to extreme temperatures in a conventional oven or during the cooking process. Everything is converted under one roof at Clifton, we are the only UK company that can offer our Made2Cook in the following formats Plain or Printed which are made in-house. 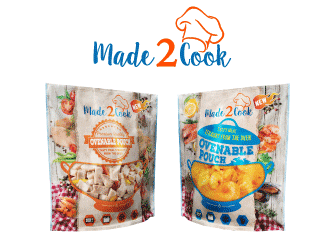 Our other Made2Cook range are our Made2Cook Film.